Ne a Cologne le 24 janvier 1930, Mort le 12 mai 2001 a New York. 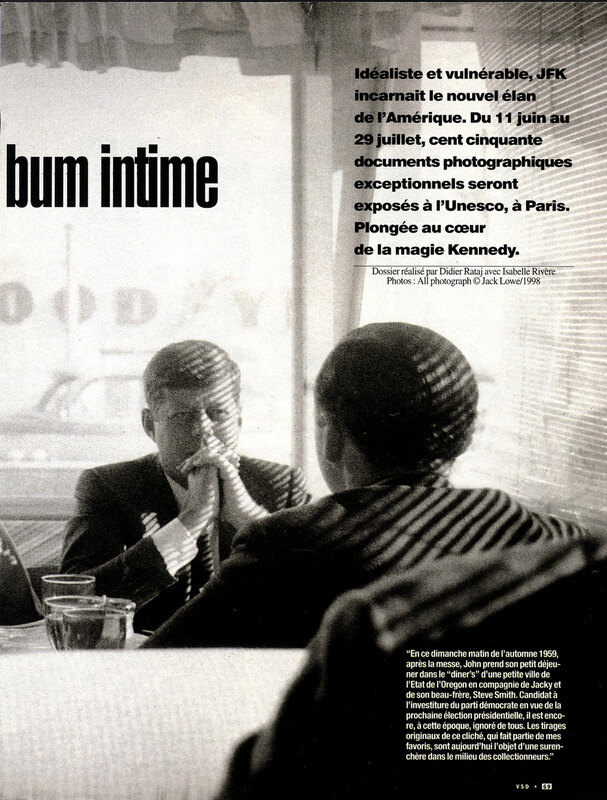 Les photographies des Kennedy par Jacques Lowe sont devenues le symbole d'une période qui reste à jamais gravée dans le cœur des Américains. À la mort de Lowe, certains observateurs ont affirmé que ses images avaient contribuées à créer un mythe idyllique. Des 40 000 photographies des Kennedy prises par le photographe, seules quelques centaines ont été montrées et tous les négatifs, qui étaient entreposés dans un coffre du World Trade Center, ont été détruits le 11 septembre 2001. Jacqueline Lee Bouvier épouse Kennedy, puis Onassis, surnommée « Jackie », née le 28 juillet 1929 à Southampton (New York) et morte le 19 mai 1994 à New York, est une personnalité américaine. 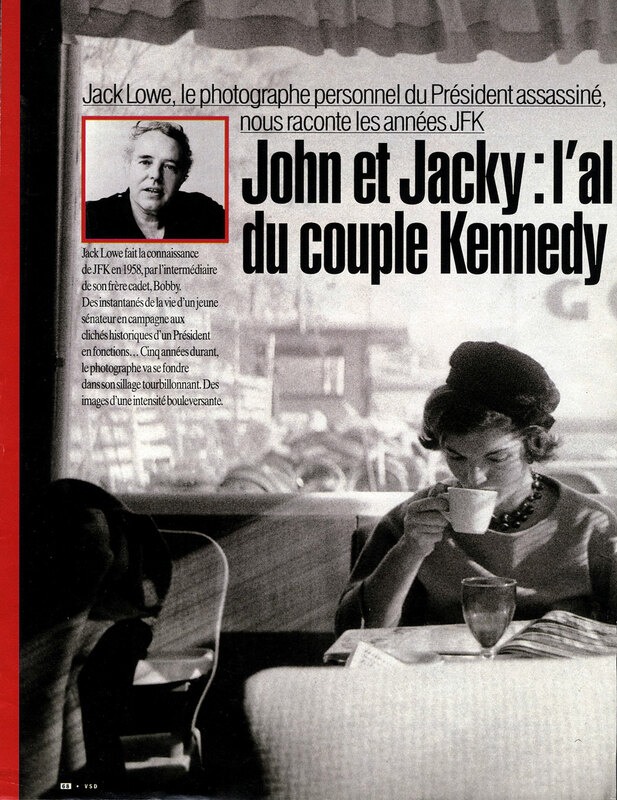 En sa qualité d'épouse du 35e président des États-Unis, John Fitzgerald Kennedy, elle est la Première dame des États-Unis du 20 janvier 1961 au 22 novembre 1963 lorsque son époux est assassiné à ses côtés en traversant les rues de Dallas. Grâce à son élégance, sa simplicité et sa beauté, elle devient l'une des Premières dames les plus populaires et les plus photographiées. En 1968, Jacqueline Bouvier Kennedy épouse l'armateur et milliardaire grec Aristote Onassis, ce qui lui vaudra le surnom de « Jackie O. ». Le cliche est pris le photographe et tire sous son controle. Les negatifs a cette epoque etaient sur film souple et le tirage se faisait avec agrandissement. de format 20,5 / 28,5 cm. Original des annees 1960 - 61. Le mythe s'est effiloché sous les griffes des vérités, l'icône a fini, ainsi que l'aurait prédit de Gaulle, «avec un pétrolier». Fini, pas tout à fait... Un cancer de la lymphe montra son courage et redora l'image de Jackie K. devenue Jackie O., deux mots qui furent aussi l'enseigne d'une boîte branchée de New York. Les icônes brillent plus de néon que d'or à l'époque d'Andy Warhol. Pour ce photographe, tout usage de cette epreuve autre que prive est soumis au controle de ses ayant droits. 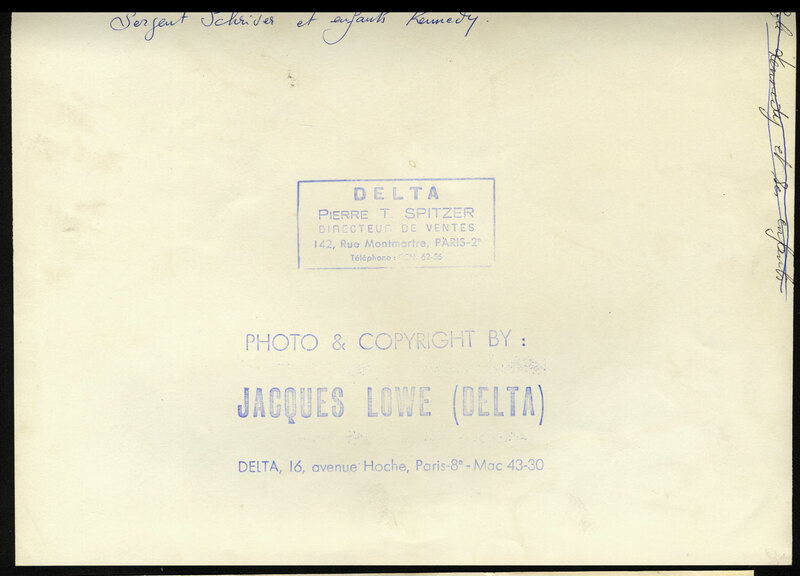 Oeuvre ancienne en tirage original vintage..
Jacques Lowe is an internationally renowned photographer and photo journalist who is best known for his portraiture of the leading personalities of our time, nationally and internationally, in politics, business, and the entertainment world. In 1951, Mr. Lowe was a prize winner in LIFE magazine's contest for young photographers, after which Roy Stryker, the grand old man of photography, gave him an eight week assignment in Europe. Starting in 1953 as a contributor to JUBILEE magazine he won numerous awards for his photo journalistic work among gypsies and other minorities. He went on to contribute to such magazines as TIME, LIFE, LOOK, The Saturday Evening Post, Ladie's Home Journal, Paris Match, Epoca, Stern, and many others, and he was a staff photographer at Collier's Magazine at the time that journal folded. In 1956, through his work, he befriended Robert F. Kennedy who had been appointed majority counsel to the McClellan Committee. 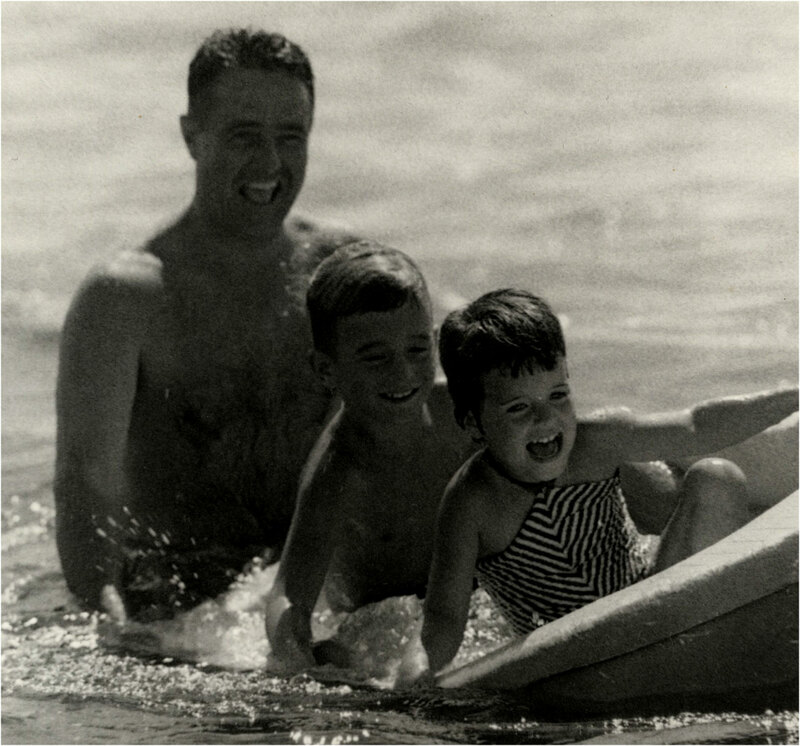 In 1958 Ambassador Joseph P. Kennedy, who admired his work, asked him to photograph his "other son, Jack." That assignment led to his becoming the Official Campaign Photographer of John F. Kennedy's quest for the presidency and, when elected, the personal photographer of President Kennedy. Although offered the White House Photographer's job Lowe declined, but the president asked him to "stick around and record my administration. Don't worry, I'll make it worth your while." His work for the campaign, the Kennedy White House, and the Kennedy family has resulted in six books, numerous exhibitions from the USA to Moscow, several prime time television shows, and some 150 major magazine pieces and covers. 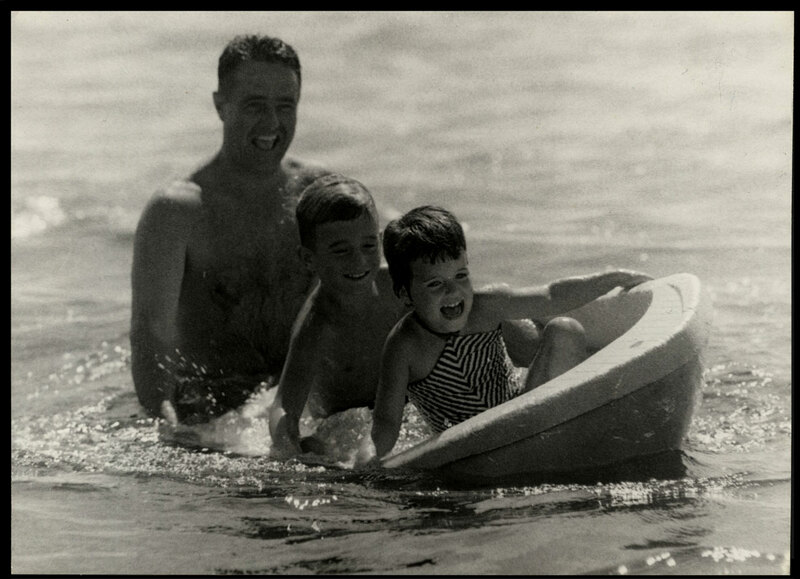 Reviewers have credited Lowe's "natural, warm, and intimate images of the president and his family and the workings of the presidency with keeping alive the Kennedy flame for generations yet to come." Jacques Lowe and Jacques Henri Lartigue at one of Lowe's Paris exhibitions. Following his work at the Kennedy White House Lowe returned to his studio in New York where he renewed his magazine, advertising and corporate photography work. His clients ranged from AT&T to Hertz Cars, from DuPont to United Airlines He won numerous gold and silver art director's awards for his commercial work. In 1968, following the assassination of his friend Bobby Kennedy, Lowe sold his very successful studio and moved to France. "I couldn't deal with these tragedies anymore," Lowe says "I had to get out." He stayed for eighteen years, during which time he more or less gave up photography. Jacques Lowe and Bryant Gumbel, host of the Today Show after one of Lowe's appearances. Returning to New York, Lowe again turned to photography with a passion. His assignments ranged from the New York Times Sunday Magazine to People, InStyle, and George. He extended his work to television, contributing to many documentaries on ABC, NBC, CBS, and many cable programs. He produced a forty minute video for PBS on the Kennedy Years, and is currently working on a major video series about jazz. As a book packager he has produced a twelve volume series of children's books on art for Hyperion/Disney Looking at Paintings (John Russell in his review in the NY Times called it "an exquisite walk through a small museum"), a children's series on photography for Chronicle books, and a highly acclaimed book of Jazz portraits, Jazz: Photographs of the Masters. He has published over thirty books, including volumes about London's financial center, "The City," Pope John Paul II's travels to South America, Pilgrimage, Persepolis, the fabled city in Iran and Kentucky a loving view of that state. His book on children What Kids Do... came out in 1998. U.S. Ambassador to France Felix Rohatyn at UNESCO headquarters. Paris, July 1998. Lowe also dedicates his talent and time to a great deal of pro bono work. In 1992 he went to Somalia for CARE, reporting on that country's tragic disintegration, a dangerous assignment. His work there received wide television coverage. He has contributed an exhibit, "A Tribute to Jacqueline Kennedy Onassis" to the Leukemia Society of America to help raise capital to start the "Jacqueline Kennedy Onassis Lymphoma Research Fund." The exhibit opened at Union Station in Washington, D.C. in September of 1995 and has so far traveled to some twenty­seven cities. The exhibit has raised nearly $3,000,000. The exhibit will be permanently housed at the Sixth Floor Museum in Dallas, Texas as of President's Day 2000. Two further Jacqueline Kennedy exhibits are currently travelling throughout the United States. Mr. Lowe has had major exhibits in Paris (Month of Photography, 1990), Moscow (Hall of Journalism, 1991), Lausanne (Musée de L'Elysée 1992), the Museum of Modern Art, NY (American Politicians, 1994, a groupshow), in Lille, France, 1996 and Brussels, Belgium, 1996. On June 11, 1998 Jacques Lowe mounted a major exhibit, 160 photographs, at UNESCO's Paris headquarters. It was opened by Ambassador Felix Rohatyn, and Robert F. Kennedy Jr. This was the first time that an American official set foot on to UNESCO headquarters in seventeen years. The exhibit is slated to travel throughout Europe and the world for the rest of the coming decade and in the year 2000 the Montreal Museum of Contemporary Art will mount an exhibit of Mr. Lowe's Jazz Photography. In September of 1997, Mr. Lowe mounted his first gallery exhibit in New York at the LEICA Gallery, NY (all other exhibits had been mounted in public places). The exhibit was repeated at the Govinda Gallery in Washington, DC, the Peter Fetterman Gallery in Santa Monica, CA, the Gallery for Fine Photography in New Orleans, and the Fotofusion Gallery in Del Ray, Florida, all in 1998. In 1999, he mounted a Jazz exhibit at the Westwood Gallery in Soho, New York. Further gallery exhibits are planned for the year 2000. Lowe's work is in the permanent collection of the Museum of Modern Art, NY, the Elysée Museum in Lausanne, Switzerland, the European Center of Photography in Paris, the Kennedy Library Museum in Boston, the Sixth Floor Museum in Dallas, Texas, as well as in hundreds of private and institutional collections. 1996 Jacqueline Kennedy Onassis, A Tribute opened at Union Station, Washington, D.C. in September, 1996. All proceeds were to benefit the Leukemia Society of America. The exhibit has since traveled to 29 cities including Chicago, Los Angeles, Pittsburgh, Detroit, Boston, Denver, Atlanta, Dallas, Houston, Palm Beach. The exhibit has raised close to three million dollars to aid non-hodgkins lyphoma research. The exhibit will be permanently installed at the Sixth Floor Museum, Dallas, Texas on President's Day 2000. 1998 UNESCO Paris, An American Dream, UNESCO headquarters. 1998 Newseum, Washington, D.C. In connection with the photographer's Crystal Eagle Impact on Photo Journalism Award, a Lifetime Achievement Award given by the University of Missouri School of Journalism and Kodak. 1998 Govinda Gallery, Washington, D.C.
Pour ce photographe, tout usage autre que prive est soumis au controle de ses ayant droits.